History of the yurt. Past and the present. Yurt is one of the man’s greatest inventions comparable to the invention of the sail. Both of them helped to cover long distances. Yurt together with the horse allowed to the Turkic people conquer the territory from the Danube to the Yellow sea i.e. Great Steppe. Empires of the Xiongnu, Huns, Gok Turks, Kipchaks, Mongols and other less known nations appeared and vanished on these territories replacing each other. Some of those empires were three times bigger than The Roman Empire. First nomads for example the Hunns used to roam with kibitkas i.e. tents on wheels. The yurt could be transported on a horse which increased mobility and cross-country ability. Only loaded horse or camel as well as man could easily pass through a narrow path but wheels were useless there. From then on having yurt for the nomad meant that snow covered mountains, thick forests and fast rivers were not obstructions for human anymore. Four meter diameter yurt can be transported by two horses which can cover almost 35 miles a day including the time for rest. And if the nomad has hundreds of horses he can increase the distance up to 55 miles in emergency cases. Simple calculation shows that nomads could cover 560 miles in ten days. It is proven by the speed of their conquests. The yurt which was invented thousands of years ago is still interesting for us. 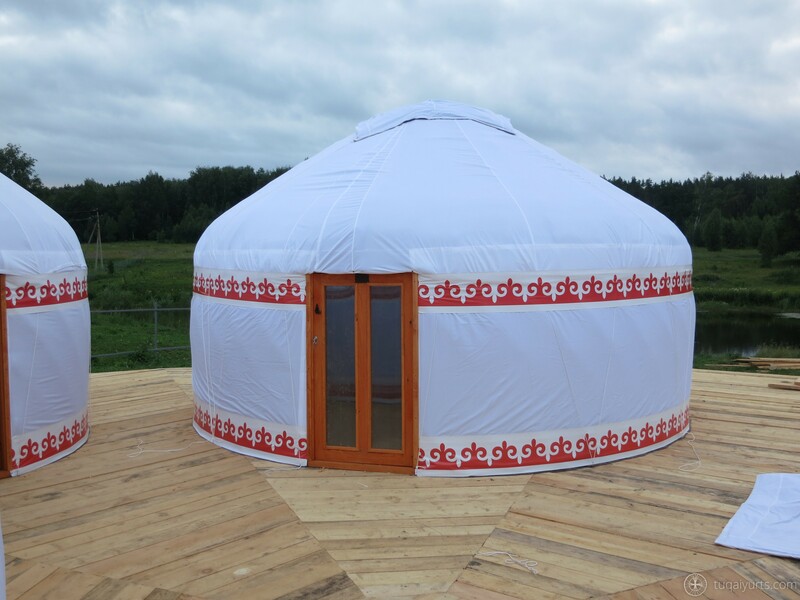 The yurt is light, portable, can be used all-year round, its details are easily interchangeable – all these qualities together with low price make it highly competitive on the market. The maintenance of the yurt is very cheap too, you do not have to be highly qualified for its mounting and service and you need minimum space for its storage. At the same time it is considerably cheaper than other shell constructions. In ancient times Bashkort as well as other Turkic peoples used to live in yurts which they called “teerme” which is similar to other Turkic yurts, and parts of the yurt are called the same but there are some differences between “teerme” and the yurts of other nomads. The roof is more high-pitched which is influenced by heavy rainfalls on the Ural Mountains in comparison with the Great Steppe. 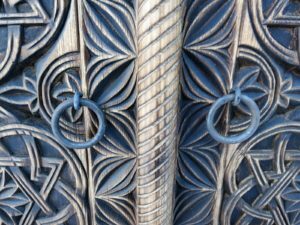 The doors should be only wooden, leather or felt. The “teerme” is never covered with cane mats and it is built of not only willow but oak, maple, elm and linden can also be used. Bashkir “teerme” is a Turkic yurt but there are proves that on the North-East of the territory of the Original Bashkortostan there were found some Mongolian yurts as well. For the past decades the yurt becomes more and more popular. Nowadays many companies in Europe and USA produce and maintain them, showing us the attractiveness of this wonderful and romantic house. These days tourism especially ecotourism becomes very popular but at the same time it is less presented on the market. The nature of the republic of Bashkortostan is amazing and it is quite expensive for fans of camping to build proper holiday camps and the tent doesn’t provide us all the necessary comfort. 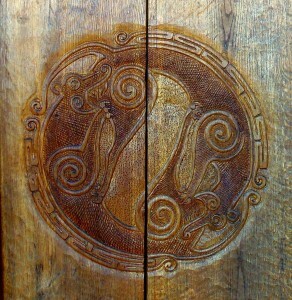 That is where the yurt has privilege with its balance of price and comfort. Very stable skeleton covered with thick felt and waterproof fabric on top makes you feel comfortable, warm and bring you back to the old times of the Turkic tribes which is very unusual and precious in our urbanized and technologically developed century. 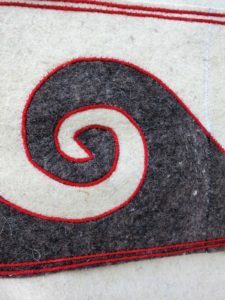 The yurt covered with two layers of felt and provided with wood stove can be used all year round (up to -25C). Camp yurt is the lightest variant of the yurt, it can be transported by one horse and gives the tourists comfortable and romantic rest every night. 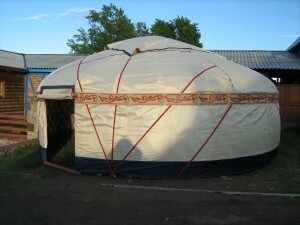 This yurt can be mounted within 30 min. and it is essential for riding tourism. The main problem of the holiday camps is the absence of camping facilities. 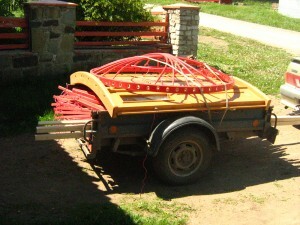 One small lorry can transport 5 yurts which are lodging for 20 hikers and 5 service staff of the camp. The yurts on wooden platform, provided with furnace may also be used as a ski resort in winter. 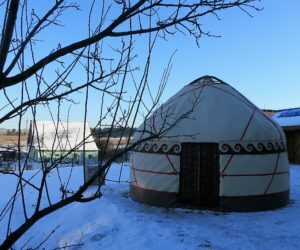 If you have your own trading, catering or hotel business for celebrations and fairs, renting a small piece of land somewhere in the city, near highways or touristic places you can use yurt as a guest house. All you need is to put the yurt up, get electric generator if needed, and you are fully equipped. You don’t need to pay utilities, accommodation rent and you don’t have to be afraid of the electricity cut off. And the unusual and exotic look of your yurt will surely attract you a lot of customers. Management yurt + rooms+ the kitchen yurt + the dining room etc. 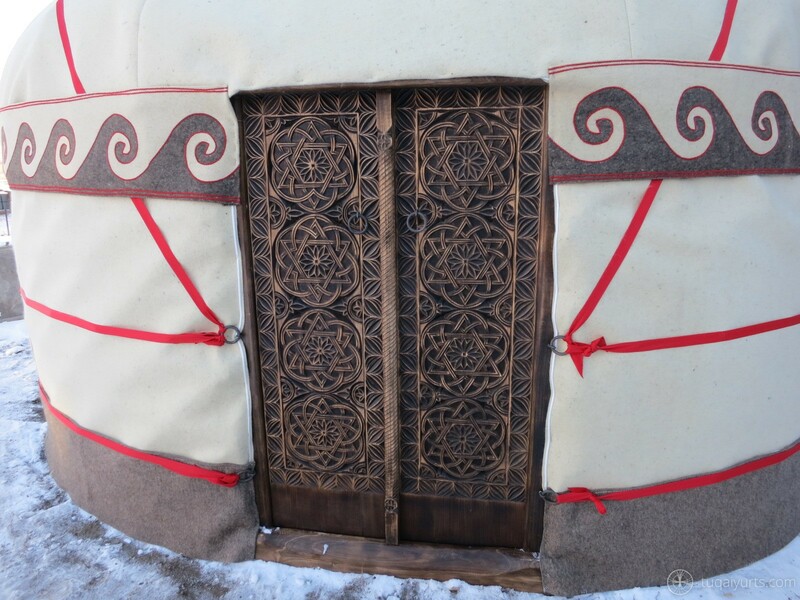 This type of yurt is collected with no metal nails and even joints and door handles are made of wood and leather. And on top of everything we use only natural handmade thick felt. 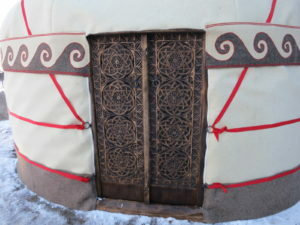 There is also possibility of interior kitting of the yurt with: wooden chests; traditional Bashkort handmade woollen carpets; horse saddles and harnesses; wooden or leather kumis (traditional drink of Turkic peoples) vessels; different tableware made of burl; bows and arrows in stamp patterned quivers and leather bow cases. 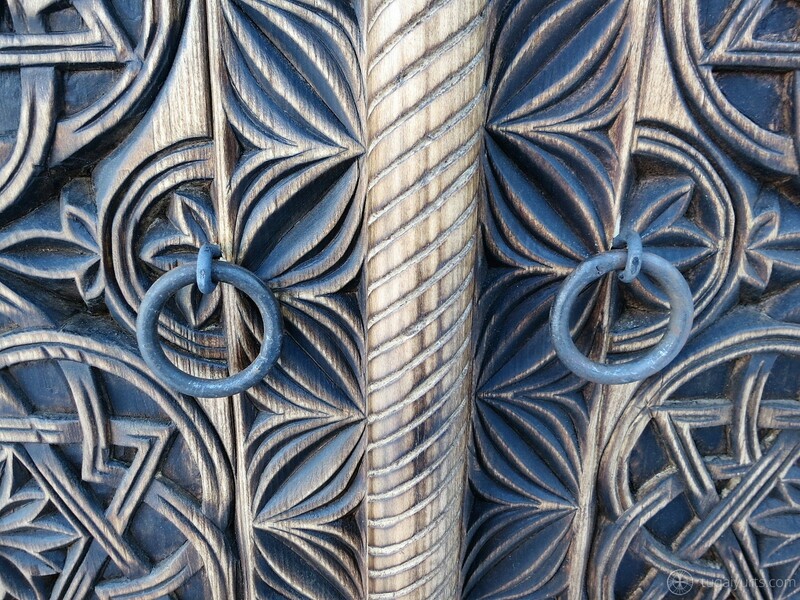 It is also possible to order different doors with carved vegetation, animals or geometric ornaments. You can have a yurt just for yourself, for pleasure. You can set it on your plot and lead a “nomad life” in summer. 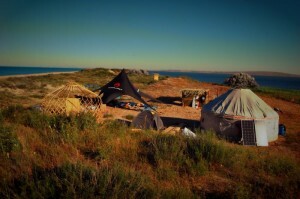 More than that you can take your yurt on your car and roam around the country or even the world. You can place your “house” on a new place every day, you save money on expensive hotel rooms and enjoy every night in your own “house”. You can sell your flat and buy a piece of land outside of the city, set the yurt up while your new house is being built. The labourers building your house can stay there and when everything’s done and your house is built you can still use the yurt as guests’ house or sell to someone else who has also decided to build a house on plot. 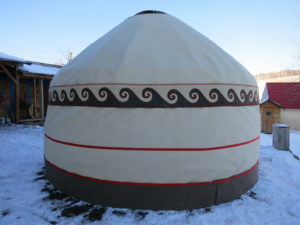 We can also make unique yurt according to your taste and desire for example of 12 meter diameter one, with the area of 113 м2! 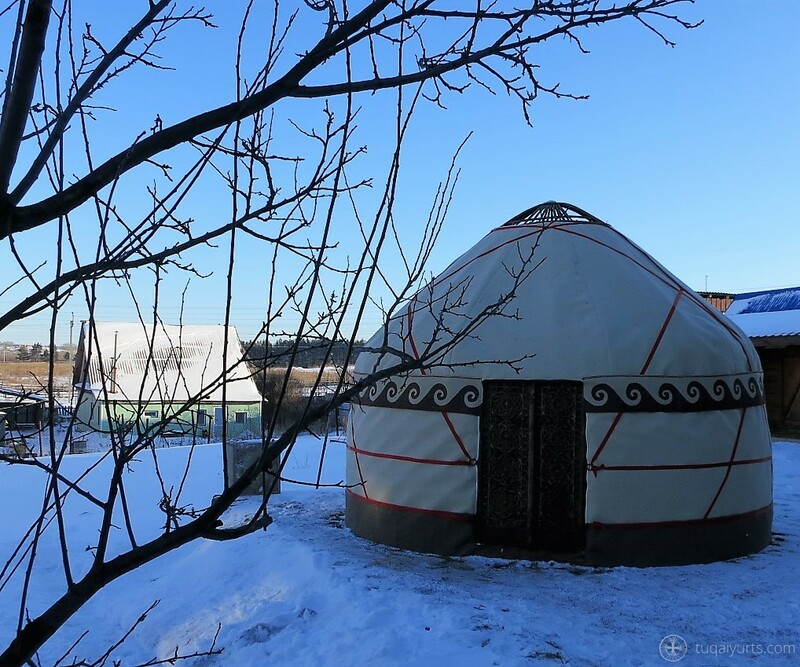 In this yurt you can celebrate festivals, holidays, even held conferences. You can mount that type of yurt and rent it out for different types of celebrations.